Discover the legends and myths and religious beliefs surrounding Anhur, the Egyptian god of war and patron of the Egyptian army and royal warriors. Anhur was depicted in human form with a headdress, or crown, consisting of four, tall ostrich feathers. Anhur is believed to have originated in Nubia on the southern most border of ancient Egypt. The ostrich was symbol of creation and light as worn by the Gods Shu and Amun. His name was translated as Sky Bearer and Anhur was later merged with Shu, becoming Anhur-Shu. Anhur was sometimes painted with blue skin, like Amun, symbolizing his association with the sky and primeval creation. Anhur was the ancient Egyptian war god and patron of the Egyptian army and also of hunters. Titles: The "Slayer of Enemies", "High of Feather", "Strong of Arm", "Lord of the Lance"
Anhur, the ancient war god of Egypt, was believed to be the son of Ra (Atum-Ra). According to myths he was the consort was the fierce lion goddess Mekhit. Anhur was the champion of Upper Egypt and its pharaohs. Anhur was revered as the god who hunted and slew the enemies of the sun god Ra. The cult center of Anhur was located in Thinis. The main cult center of Anhur was in Thinis which was the was the capital city of the first dynasties of ancient Egypt. Thinis was said to be the home of the first kings of a unified Egypt, the Pharaohs of the First and Second Dynasties. The first Pharaohs were buried in Thinis. The city was a political and military center. 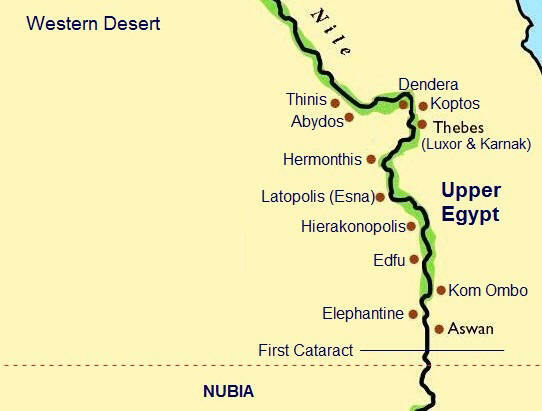 It held a large garrison of troops with chariots and weapons and prior to the unification of Upper and Lowe Egypt acted as a departure point for more northern military expeditions. Thinis was therefore an ideal location for the cult center of Anhur. The royal warriors would take part in festivals and celebrations and make offerings at his temple, which acquired considerable wealth. Anhur was the model warrior to the armies of the Pharaohs and believed to be the "saviour" of those in battle. A second cult center dedicated to Anhur was located in Sebennytos which was located due east of the city of Sais in the northern Nile Delta of Lower Egypt. 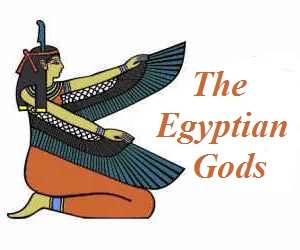 There are no details of the dates of festivals dedicated to Anhur but we do know that in Thebes there were 65 festivals every year in honor of Amun and the Theban triad of gods. However, as a major garrison town the Egyptian soldiers would have relished the opportunity to form part of the lavish processions in honor of Anhur in which the might of the pharaohs army would be on parade. Celebrations during the Festival of Anhur would have included a magnificent river procession during which a statues of Anhur would have removed from his temple and ceremoniously placed on a gilded ceremonial barque, equipped with long poles that were carried on the shoulders of their priests to the bigger river boats. The massive processions consisted of standard bearing Egyptian soldiers, special army units, royal charioteers, priests, musicians, singers and dancers. 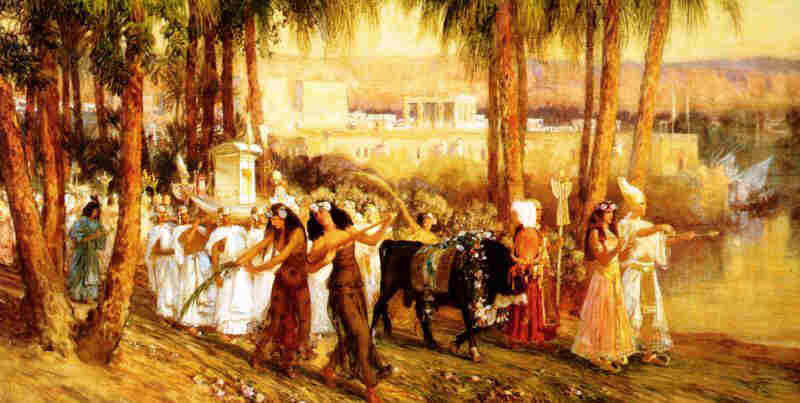 The entire city of Thinis would have flocked to the river bank and join the long procession that accompanied the teams pulling the god's great barge with heavy tow ropes. Other spectacles in honor of Anfur at Thinis and Sebennytos included mock battles which served to demonstrate the might of the army and the prowess of its warriors. Mock battles were also also part of military training to improve the weapons skills of soldiers, the tactical co-ordination of units and a realistic experience of combat outside the genuine battle field. The weapons used by the ancient Egyptian army included sling, the spear and the bow and arrow. Close combat weapons included the mace, battle axes, daggers and swords. Chariots were introduced after the Asian Hyksos armies invaded the Delta during the period of the Middle Kingdom. War chariots were used as weapons in themselves, having spiked and bladed wheels and chariots could scatter an enemy force by charging them. The war god Anhur was believed to have originated in Nubia, now Sudan. The Romans conquered Egypt in 30 BC Egypt when the country became a province of the Roman Empire (30BC - 641 AD). 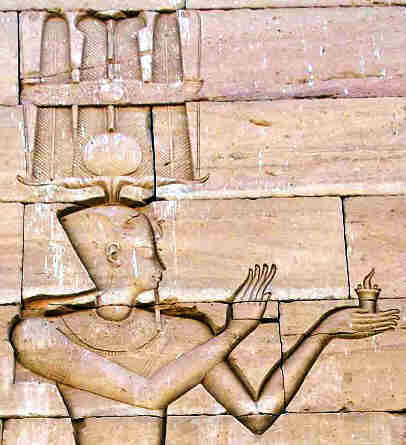 Kalabsha Temple in Egyptian Nubia was built by Emperor Gaius Julius Caesar Augustus and is represented in a stone carving wearing the four-plumed crown of Anfur and holding an Incense Burner. 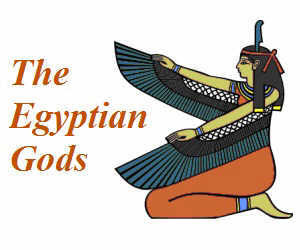 His depiction wearing the crown of Anfur conveys his divine position to the ancient Egyptians and his prowess as a great warrior of Rome and the might of the Roman Empire. Discover interesting information and research facts about Anhur, the Egyptian lotus god of healing. The facts about Anhur provides a list detailing fascinating additional info to increase your knowledge about Anhur in Egyptian Mythology. Fact 3: Members of the ancient Egyptian military often carried small statuettes of Anhur as good-luck charms. Fact 6: Some depictions show him as a god with blue skin, which symbolizes his position as a sky god.